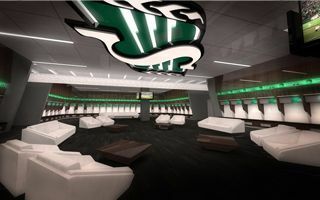 Over the last hours Saskatchewan Roughriders have revealed the interiors of crucial sporting facilities planned within the new Mosaic Stadium. The building, now with concrete bowl complete and roof rising, will house possibly the best amenities in Canadian football. Here’s a brief tour of the planned amenities. We begin at the football operations reception. And one place we’d see ourselves in!